Almost half a century ago, a trucker stopped by a little cafe in Quebec in Canada and asked for french fries with cheese curds and some gravy. Perplexed by the odd choice of culinary components, the cook at the cafe said, "It will make complete poutine (mess)," but proceeded anyway to invent what has now become the most popular food across the Great White North. "If you ask folks in Canada which is 'the' Canadian dish, poutine is the one that comes on the top," the Chef says. Poutine, which is a slang for messy is part of the a la carte menu of the food spread here. "With the french fries, melted cheese and the gravy, it is really a messy kind of a dish, but it is messy more in the context of old leftover food," he says. 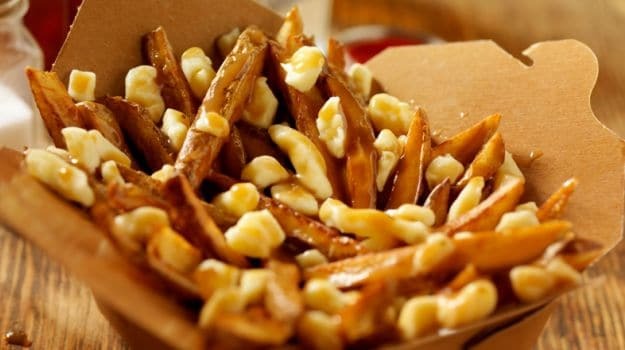 Often consumed independently as a snack back in Canada, the cheese curds in Poutine are made from fresh cow's milk by splitting the fat out using rennet. "The cheese curds are similar to paneer except that paneer is set with vinegar whereas these are set with rennet which comes from the stomach of baby cows," he says. The brown coloured gravy is traditionally a light and thin chicken, veal, or turkey gravy, mildly spiced with a hint of pepper, or a sauce brune which is a combination of beef and chicken stock. 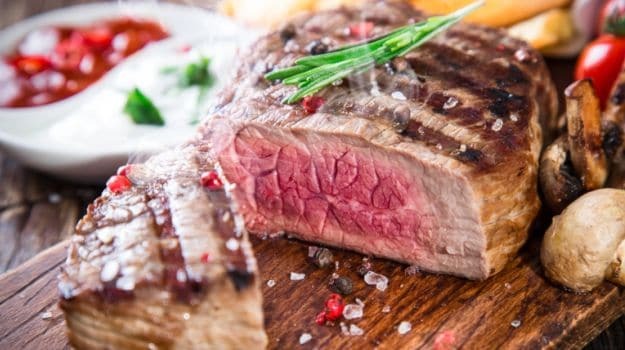 The Canadian cuisine, according to the chef, is largely "rustic" and "simple" often reflecting their way of life. "A lot of the traditional Canadian food is rustic and simple. It is really a kind of the thing of the peasant, sort of working hard, cold weather type of food. We aren't complicated people," Chef Curtis quips. Tourtiere or the meat pie which is usually stuffed with finely diced pork, veal or beef is a traditional dish that has been served by generations of French-Canadian families, is one such example. Vegetarians can dig into the 'Stuffing,' which is prominent in both Christmas and Thanksgiving dinners across Canada. Essentially bread and vegetables, it is often eaten in conjunction with cranberry sauce. A Canadian Christmas meal is conspicuously incomplete without the roasted turkey and the traditional sides of sweet potato casserole and mashed potatoes. A perfect combination of gooey and crunchy, sweet potato casseroles are serve up with a marshmallow topping and a little nutmeg for flavour. practice for over centuries now includes cooking the fish directly on fragrant cedar planks, making the flavours of both wood and fire permeate the flesh. "They soak the wood in water and place the fish over it. The wood is then put directly on to the fire, preventing the wood from burning completely but it does char it a bit. "As it is cooking, the moisture comes off the wood and steams the fish and you get the flavours of the wood along with the flavours of the fire," the chef explains. Smoking meat and then drying it, whether it is chicken, turkey, beef or pork, is also used for preservation in the cold weather. Due to the lack of availability of cedar, the chef has replaced it with mango wood for the buffet here. "We are imitating it with mango wood. Mango works really well and the flavours are good," he says. The Canadian cuisine is expectedly rich in seafood, and hence, squids, oysters and scallops form a significant part of their staple diet. 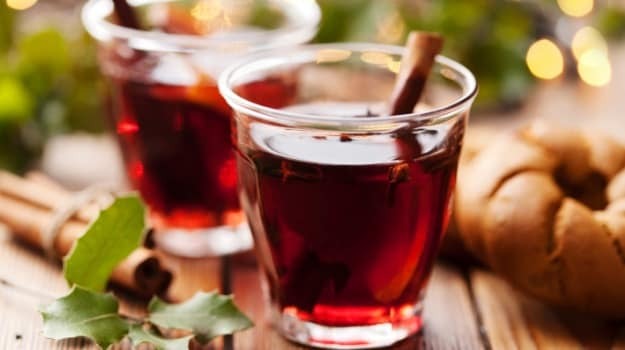 As for the drinks, Canada is among the largest producers of wine in the world, but it is their exclusive ice wine that gives them a brownie point. The production of ice wine which is made out of frozen grapes, is extremely tedious and follows a strictly measured procedure. "In order to make the wine, it has to be a certain time of the year, the weather has to be just right. You have to pick the grapes in the night time. They have people who race out in the field to pick the grapes as fast as they can and crush them while they are still frozen. Everything is done outdoors and very quickly. "The problem is if the weather starts to get a little warm and the grapes start to go bad, you might lose your entire harvest of ice wine. That's why a bottle of ice wine is very small and very expensive," the chef explains. The last bite at a traditional Canadian Christmas dinner is likely to be a wee bit too sweet, which Chef Curtis has reproduced in its full spirit with an array of tiny colourful treats from tarts and fruit cakes to cookies and candy canes spread across an entire table. CommentsEggnog or egg milk punch is among the customary desserts that find place in Christmas dinners. 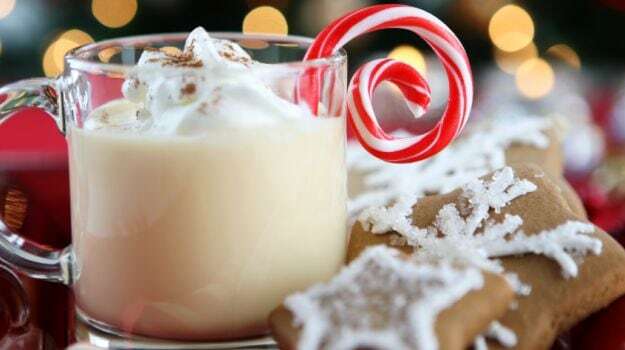 "Traditionally made with milk, cream, whipped eggs and spirits such as brandy, rum or bourbon, the chilled beverage is often garnished with a sprinkling of ground cinnamon or nutmeg," the chef says.